"War is wherever I want it to be." Profile: Nothing is more exhilarating to Twin Twist than the feeling of sinking his drills into a slag of unblemished carbon-steel. Like a child in a wading pool, he splashes among the shards of useless metal that result from his destructive fury. And his habit of showing off his talents to almost any target, whether an enemy Decepticon or a harmless lamp post, causes extreme concern for Autobot Leader Optimus Prime. Optimus realizes that the wrecking of property belonging to innocent Earthlings can only hurt the Autobot cause. Twin Twist's wild, uncontrollable nature is a big plus in battle, but many of his fellow Autobots think he's more trouble than he's worth. Abilities: Nearly as mobile as his brother Topspin, Twin Twist can go up to 200 mph using his four wheels and his two tractor modules in vehicle mode. He'll usually follow Topspin's initial assault on a target with his own: he uses his two diamond-tipped drills, which can go as fast as 6000 rpm, to penetrate virtually any fortification up to three yards thick. He carries a semi-automatic cannon-rifle that fires explosive shells, each with the energy equivalent of 100 pounds of TNT. He can transform from vehicle to robot mode in .4 seconds, but can only use his drills in vehicle mode. 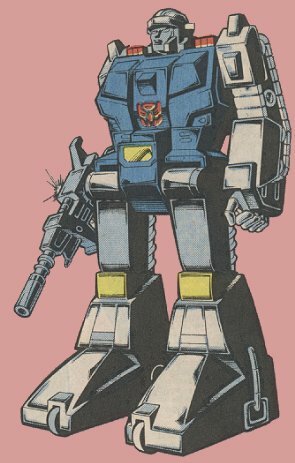 Weaknesses: His reckless nature often gets him into trouble, and has even led Optimus to consider making him inoperative. He is at a relative disadvantage in robot mode without the use of his drills.